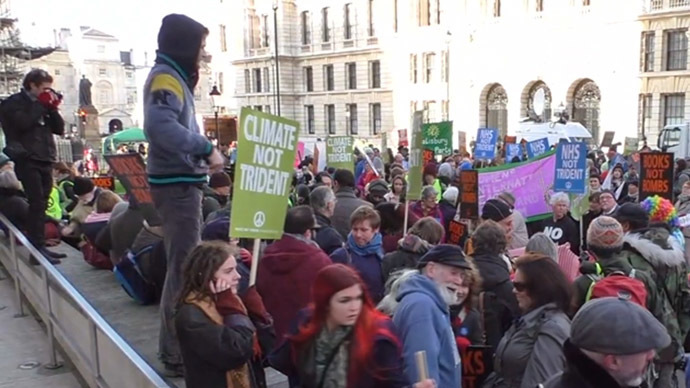 Thousands of CND campaigners wrapped the UK Ministry of Defence in a two-mile long 'peace scarf' to protest the imminent overhaul of the sea-based Trident nuclear defense system. Protesters carried placards reading "Books Not Bombs" and "Climate Not Trident", as they loudly chanted: "Wrap up Trident, ban the bomb now!" The demonstrators are attempting to put pressure on a political class that has steadfastly supported Trident, despite public indifference. "They should know that scrapping Trident is a vote winner, not a vote loser," said Kate Hudson, the general secretary of the Campaign for Nuclear Disarmament (CND). The demonstration comes after a parliamentary vote about the £100 billion ($150 billion) upgrade, during which only 37 MPs voted to scrap the program, with 364 endorsing it, and 250 abstaining, including opposition leader Ed Miliband. "The British people will not stand for masses of our taxpayers' money being spent on nuclear weapons." Rebecca Johnson, vice-president of the CND says it’s unthinkable that a government could spend such vast sums on an outdated weapons system, which she believes is pointless and if used would lead to the deaths of hundreds of millions around the globe. “Nuclear weapons are the most outdated stupid weapons of the 20th Century that have no realistic place in the security or the defense or deterrents policies of sensible nations in the 21st Century, so scrapping Trident is really a no brainer for the British people,” Johnson said, speaking to RT. The vice president of the Campaign for Nuclear Disarmament wants Britain to take the first step that could lead to eventual nuclear disarmament globally, by not renewing the Trident system. Designed in the 1980s with the aim of staving off Soviet threats, and in service since the mid-1990s, the submarine-based Trident is currently the UK's only nuclear launch system. No specific designs for a replacement have been drawn up so far, and the possibility of a cheaper alternative still remains under consideration.